All spacecraft are made for extreme environments. They travel through dark, frigid regions of space, battle intense radiation and, in some cases, perform daring feats to land on mysterious worlds. 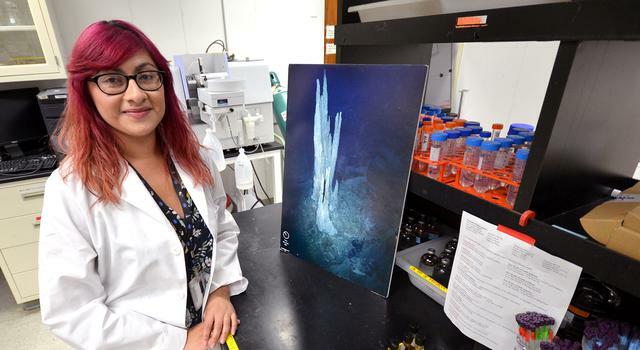 But the rover that Tonya Beatty is helping design for Venus – and other so-called extreme environments – is in a class all its own. Venus is so inhospitable that no spacecraft has ever lasted more than about two hours on the surface. 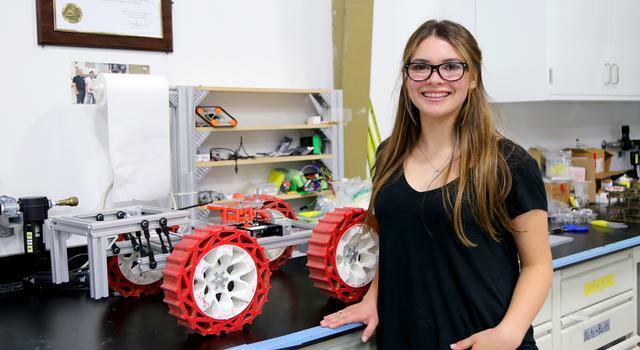 So Beatty, an intern at NASA's Jet Propulsion Laboratory and an aerospace engineering student at College of the Canyons, is working to develop a new kind of rover that's powered mostly by gears rather than sensitive electronics. We caught up with Beatty just before she embarked on another engineering challenge – JPL's annual Halloween pumpkin-carving contest – to find out what it takes to turn an impossible idea into a reality. I'm working with a team on the HAR-V project, which stands for Hybrid Automaton Rover-Venus. It’s a study to develop a rover meant to go to Venus. I'm assisting in the development of mechanical systems and mechanisms on the prototype, using clockwork maneuvers. This rover will use minimal electronics, so when I say clockwork, I mean gears and anything that does not rely on electronics. Why is this rover not relying on electronics and relying more on a gear system? The environment on Venus includes sulfuric acid clouds, a surface pressure about 90 times what it is on Earth and a temperature that exceeds 800 degrees Fahrenheit. The materials in most electronics would melt in that extreme environment, so that's why we're trying to go mechanical. The previous landers that have gone to Venus have relied on electronics, and the one that lasted the longest only lasted 127 minutes, whereas ours, using the mechanical design, is projected to last about six months. So that's why we're going with this design. A typical day for me consists of designing mechanisms, designing mechanical systems, ordering parts for those mechanical systems, testing them on the active prototype that we have and redesigning if necessary. It's kind of a mixture of all that, depending on where we're at in each step. What is the ultimate goal of your project? My personal goal with this internship is to connect the things I'm learning in school to real-world applications, as well as see what it would be like to be an aerospace engineer. Specific to the HAR-V study, my goals are to design a power-transfer mechanism, redesign the reversing mechanism on the rover itself, and redesign the obstacle avoidance mechanism. Those are all things that I'm now learning as I'm doing the internship, which is great. I love learning new things. As for HAR-V itself, the goal is to be able to withstand those extreme environments for longer than 127 minutes and retrieve the groundbreaking data that we've been wanting from Venus but haven't been able to get because we haven't had the time we need [with previous landers]. Personally, at 19, I never thought that I would be working on a rover for Venus at NASA. By sharing my story, I hope people take away that some of the things they might think are impossible are really right there. They’ve just got to reach for it. 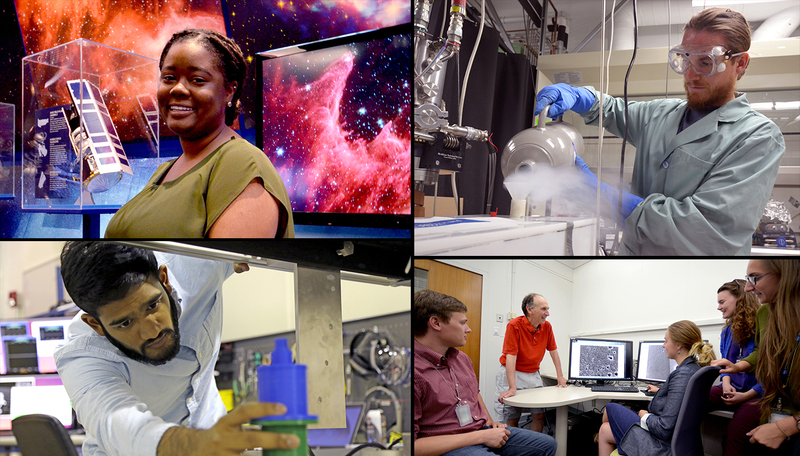 What's the most JPL or NASA unique experience that you've had so far? As much as I'd like to say something cool like watching the rovers being tested, I have to say it's the deer. Every day, wherever I go – to laser-cut something or go get a coffee – I see deer. One day I saw six. I just think that's so unique because it’s something I never expected to get from this experience. And I think it’s unique to JPL. Speaking of unique experiences, your group holds an annual pumpkin-carving contest and makes some amazing creations. Are you planning to participate in the contest this year? I actually just got the emails today. I didn't know this was a JPL thing. It's a big deal! So, yes, I'd like to! Do you know what your team is planning to make? Don’t worry, we won’t share this until after the contest, so it won't leak to any competitor. 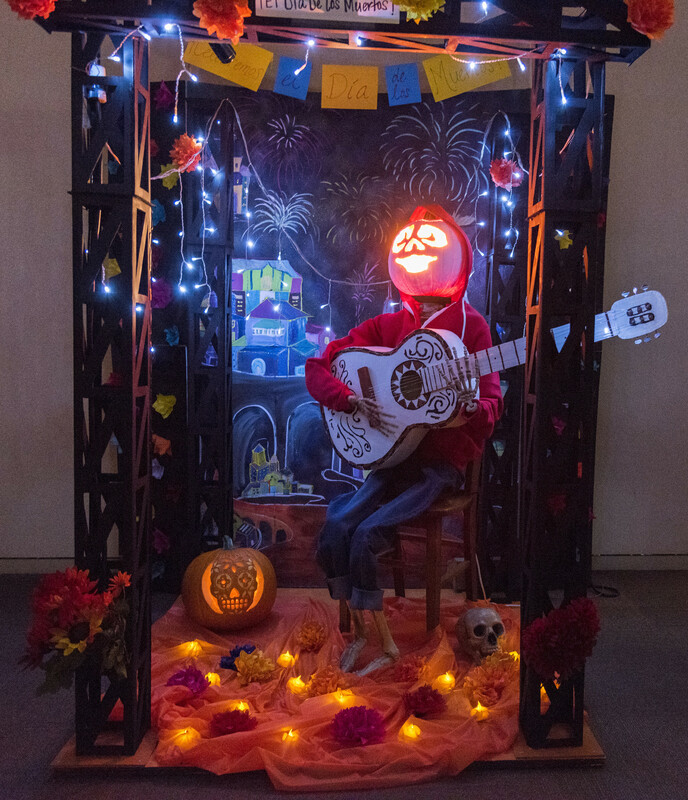 We're making Miguel from [the movie] “Coco” with his guitar, and we're going to try and make it move. How does designing a mechanical or creative pumpkin compare to designing a rover for Venus? Well, with a pumpkin, I would care about how it looks, whereas with the rover, I care about how it functions. A pumpkin has real guts, and a rover has metaphorical guts. It's got to keep on going. But I think the biggest similarity is the creativeness between both of them, because you have to be creative to make an innovative pumpkin. Just like when you design a rover, you have to be creative; you can't just be smart. You have to have those creative ideas. You have to think outside of the box to actually design efficient and effective components, and you can't just give up. When you have a failed attempt, you try it again. Do you have any tips for anyone who want to make a creative pumpkin? Don't be afraid of your ideas. Sometimes we limit ourselves because we're like, “You know that's too crazy. We shouldn't do that,” but it takes crazy ideas to be an engineer and it takes crazy ideas to carve a good pumpkin. OK, back to your internship: How do you feel you're contributing to NASA missions and science? I think my active participation in the rover study is helping contribute to NASA-JPL missions, because something I have designed could very well be on an actual rover that could go to Venus, that would retrieve data, that does help NASA. So I think in that sense, I am contributing. One last fun question: If you could travel to any place in space, where would you go, and what would you do there? I would go to Europa. I would like to see first-hand if there is an ocean and if there's an environment that could sustain life. Chemistry has always interested me, so I would love to see that up close and analyze everything.